Sly Dunbar & Robbie Shakespeare recording overdub session produced by Bill Laswell. Released on Sly Dunbar & Robbie Shakespeare: LANGUAGE BARRIER, Island 90286, 5 August 1985. Released on CD Sly Dunbar & Robbie Shakespeare: LANGUAGE BARRIER, Island 257 279, August 1985. Master track recorded earlier at unknown date with unidentified musicians except of course Sly Dunbar & Robbie Shakespeare. Stereo studio recording, 6 minutes. Session info updated 4 December 2015. Bob Dylan (vocal & guitar), Ira Ingber (guitar), Nedra Wheeler (bass), Charlie Quintana (drums). · These tracks are nor circulating. · The songs may or may not be Bob Dylan compositions. Session info updated 1 September 2003. Bob Dylan (vocal & guitar), Greg Arreguin (guitar), Dan Schwartz (bass), Charlie Quintana (drums). Note. These tracks are not circulating. Bob Dylan (vocal & guitar), Sterling Smith (guitar), Barry Goldberg (piano), Jack Morris Sherman (organ), Jorge Calderon (bass), Charlie Quintana (drums). · Bob Dylan answers telephone calls from listeners. · Conducted by Bob Coburn. · Broadcast live by various radio stations in US and Canada through Global satellite Network. Reference. The Fiddler Now Upspoke, Volume 2, Desolation Row Promotions, pages 499-509. Stereo radio broadcast, 30 minutes. Bob Dylan, Ron Wood, Keith Richards (guitars). 1, 3, 9 Bob Dylan (vocal). 4 Bob Dylan & Keith Richards (shared vocals). 5, 6 Keith Richards (vocal). Voices Of Freedom. Rattlesnake RS076. 1-3 Bob Dylan, Ron Wood, Keith Richards (guitars). 4 Bob Dylan (guitar), shared vocals by Joan Baez, Harry Belafonte, Mick Jagger, Peter Paul And Mary, Lionel Richie, Kenny Rogers, Tina Turner and many many more. I wanna introduce some people who came along tonight. Keith Richards and Ron Wood. I don't know, where they are? (Richards & Woods appear and Ballad Of Hollis Brown is performed) Thank you. I thought that was a fitting song for this important occasion. You know while I'm here, I just hope that some of the money that's raised for the people in Africa, maybe they could just take just a little bit of it, 1 or 2 million maybe, and use it to, maybe use it to pay the mortgages on some of the farms, that the farmers here owe to the banks. The Day The World Rocked. Mama Records LP. 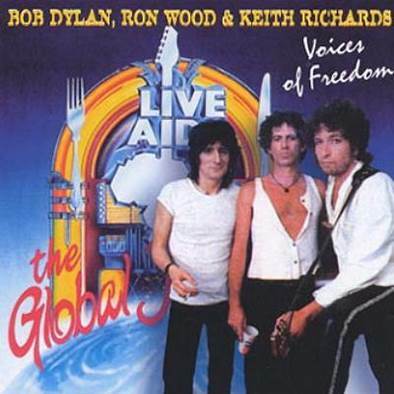 Live Aid The Global Juke Box Vol. 2. Global Juke Box LP. Live Aid. A Short Shame Story. Live Aid LP. Special Night-Special Guests. American Concert Series / Acs 018. Fragment of 3 and all of 4 released in the DVD, TWENTY YEARS AGO TODAY, Warner R2-970451, July 2005. Broadcast live on television worldwide by satellite. Dylan’s speech after the first song prompted the first Farm Aid concert later in 1985. First live version of Ballad Of Hollis Brown since the evening concert at The Forum, Inglewood, Los Angeles, California, 14 February 1974. First live version of When The Ship Comes In since Royal Festival Hall, London, England, 17 May 1964. Session info updated 5 December 2015. Sun City recording sessions produced by Little Steven and Arthur Baker. Note. Master track recorded earlier at unknown date with unidentified musicians except of course Little Steven..
1 released on single Manhattan B 50017, November 1985. 1 released on video 30 October 1985. Stereo studio recordings, 15 minutes. 1 Bob Dylan (guitar), Hunt Sales (organ), Phil Chen (bass), Clem Burke (drums). 2-13 Bob Dylan (guitar), David Stewart (guitar), Phil Chen (bass), Hunt Sales (congas), Feargal Sharkey & Steven Scales (percussion), Clem Burke (drums). 3, 6-11 Bob Dylan (vocal) and Pamela ? (2nd vocal). 14-18 Bob Dylan (vocal & guitar). Note. 3, 6-11 and 14-18 sung and played on top of the playback of the recordings released on Empire Burlesque. These live performances are however hardly audible. 2, 4, 5 mono audience recordings. 1, 3, 6-18 mono PA recordings. 13 Bob Dylan (vocal & guitar, keyboards, harmonica), Tom Petty (guitar &vocals), Mike Campbell (guitar), Benmont Tench (keyboards), Howie Epstein (bass), Stan Lynch (drums), Debra Byrd, Queen Esther Marrow, Madelyn Quebec, Elisecia Wright (backing vocals). These tracks started circulating in June 2016 when the bootleg The 1985 Rehearsal Tape became available. First known recording of Sing Me Back Home, Come Together, Lonesome Town, Rocky Road Blues, Shake, Red Cadillac And A Black Moustache, Under The Boardwalk and Save The Last Dance For Me. Stereo studio recordings, 150 minutes. Session info created 5 July 2016. Partly released on the DVD ABC NEWS CLASSICS-BOB DYLAN 1985, ABC News Productions Inc, 2007. The Fiddler Now Upspoke, Volume 5, Desolation Row Promotions, pages 1051-1052. Partly broadcast by ABC-TV, 10 October 1985 in the program “20-20”. Complete 52 minute interview available as raw TV footage. Mono TV recording, 6 minutes. 1-7, 10-13 Bob Dylan (vocal & guitar), Tom Petty (guitar), Mike Campbell (guitar), Benmont Tench (keyboards), Howie Epstein (bass), Stan Lynch (drums), Peggi Blue, Queen Esther Marrow, Madelyn Quebec, Carolyn Dennis (backing vocals). 9, Bob Dylan (vocal & guitar), Benmont Tench (keyboards), Peggi Blue, Queen Esther Marrow, Madelyn Quebec, Carolyn Dennis (backing vocals). Parts of 7, 9 released on the DVD ABC NEWS CLASSICS-BOB DYLAN 1985, ABC News Productions Inc, 2007. 1 is only a fragment. 9 and fragment of 7 broadcast by ABC-TV, 10 October 1985 in the program “20-20”. The fragments released on the DVD are shorter than in the broadcast. Available as raw ABC TV footage. Clinton Heylin in A Life in Stolen Moments. Day By Day 1941-1995 suggests that Shake is a song with Bob Dylan lyrics to the tone of Roy Head’s Treat Her Right. Mono studio recording, 45 minutes. Session info updated 9 February 2017. Bob Dylan (vocal & guitar), Tom Petty (guitar), Mike Campbell (guitar), Benmont Tench (keyboards), Howie Epstein (bass), Stan Lynch (drums), Peggi Blue, Queen Esther Marrow, Madelyn Quebec, Carolyn Dennis (backing vocals). Incomplete stereo audience recording, 15 minutes. 4-6 Willie Nelson (acoustic guitar). 3, 4 Madelyn Quebec (shared vocal). 3, 4, 6 released in the UK on DVD Bob Dylan Live Transmissions: Part One, RMS 2661, March 2008. 6 released in the UK on Bob Dylan Transmissions, Storming Music Company, SMC 2520, 3 December 2007. 3, 6 released in the UK on Bob Dylan Re-Transmissions, Storming Music Company, SMC 2642, 10 March 2008. Now And Then. Ruthless Rhymes LP. Live debuts of Clean Cut Kid, Shake, I'll Remember You, Trust Yourself and That Lucky Old Sun. Available as raw TV footage. 1 partly mono TV recording. 2-4, 6 stereo PA recording. Session info created 7 December 2015. · Broadcast by MTV, 29 September 1985. · An additional brief part later broadcast by MTV in the Liner Notes Program on Dave Stewart. Incomplete mono TV recording, 4 minutes. Bob Dylan (vocal & guitar), Unidentified musician (guitar), Unidentified musician (keyboards), Vito San Filippo (bass), Raymond Lee Pounds (drums), Carolyn Dennis, Madelyn Quebec, Elisecia Wright (backup vocals). These tracks started circulating in June 2016 when the bootleg After The Empire became available. There may be more than one guitarist besides Dylan. Session info updated 4 July 2016. Celebration of Bob Dylan’s first 25 years in the music business. · Short acceptance speech by Bob Dylan. · Broadcast by ABC-TV in the program “Entertainment Tonight” and by MTV, 14 November 1985. Mono TV recording, 2 minutes. Bob Dylan (guitar), Dave Stewart (guitar), Patrick Seymour (keyboards), John McKenzie (bass), Clem Burke (drums). · 1, 2 broadcast by BBC 2, England, 26 November 1985 in the program “The Old Grey Whistle Test”. · 3 overdubbed May 1986 and later released on Knocked Out Loaded. Stereo studio recordings, 4 minutes. Note. Partly broadcast by BBC 2, England, 26 November 1985 in the program “The Whistle Test”. Reference. The Fiddler Now Upspoke, Volume 5, Desolation Row Promotions, pages 1053-1054. Mono TV recording, 4 minutes.